Starting out as an ABC Seamless Franchise back in 1996, Brotzman Seamless Corporation remains one of the most trusted home improvement companies in Mosinee, WI. Our dedication to providing only the best results has earned us the trust of countless owners not just in Mosinee, but also in the surrounding areas such as Stevens Point, Wausau, Plover, and Rosholt, to name a few. Brotzman Seamless Corporation is an authorized dealer of Gutter Helmet, the country’s top choice for gutter covers, designed to keep gutters protected from clogging. 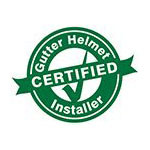 Made with both durability and innovation in mind, Gutter Helmet keeps our clients’ gutters clog free and low maintenance for years. When it comes to home improvement, quality is the name of the game. Brotzman Seamless Corporation is committed to providing top-notch quality services by using innovative solutions and ensuring excellent workmanship in every project we take. To make these possible, we have a team of highly trained professionals who have years of experience in home improvement and gutter protection. We also keep track of trends when it comes to cost of materials and services within our service areas to keep our prices within reasonable, customer-friendly ranges. We wouldn’t be here if not for our customers; that’s why customer satisfaction is one of our top priorities. Brotzman Seamless Corporation puts a heavy emphasis on going above and beyond industry standards when it comes to providing services to make sure that our customers enjoy the results of a job well done. If you want to find out more about our services, call us today at (800) 824-3772 or request a free quote online.